I thought it would be fun to post a Valentine for all of you — in the form of a short story. I admit the idea of writing a story for everyone came to me a bit late, so I knew I’d have to scramble to get it finished in time, especially since I wanted to post it a day before the holiday. I didn’t even know what it should be about, what setting, what sort of characters. Then I thought I’d make an “Atonement” story, but one that is not in the novel at all. This tale features one of the Atonement, Tennessee characters — the sheriff, Robin Warden. If you’ve read the novel, you’ll probably think he’s an odd choice, but that’s what makes it fun. The sheriff is not the most endearing citizen of Atonement. This short story takes place quite a few years before the timeline of the novel, with a much younger Robin who is only a deputy sheriff. He has recently come to the town of Atonement and of course, strange things happen. Forgive me if it gets just a little bit corny — after all, it is supposed to be a Valentine. “Hey Robin! Where’s Batman? He might let you drive the Batmobile if you’re real nice to him.” The bullies had never outgrown their taunts. Whether they were ten, twenty, or fifty, those jerks would harass him with the same old thing, Robin Warden thought as he landed on his chest with a thud. Why had he thought of them? He had been away from those guys for a month. What was so wrong with looking like Burt Ward, or being named Robin? Well, all right — he supposed he could understand how the jokes were tempting. What he didn’t understand was why they got such a kick out of the same old jabs. Robin picked himself up and continued looking for the pig. He’d been chasing it all afternoon. He couldn’t believe a stupid pig kept getting the better of him. Maybe that’s why he had thought of the bullies he’d grown up with back in Asheville. The pig was dragging his self-image through the mud. Literally. He gave a derisive snort at the memory, and a porcine snuffle seemed to answer from the other side of a bush. With a lunge he almost had the pig that time. Almost. It slipped out of his grasp like a magician, and it ran faster than anything that might someday become bacon had a right to run. Robin patted his chest to make sure the deputy’s badge was still there. At least he had that over the guys back home. He was a real deputy sheriff. Scrambling to his feet, Robin ran after the pig again. He was amazed that his Valentine’s Day was being spent that way. He asked himself what difference it made. He hadn’t made any friends in the tiny town of Atonement yet. There weren’t many people his age period. He’d only met a couple of girls, and they weren’t interested in him. He let out an irritated breath. 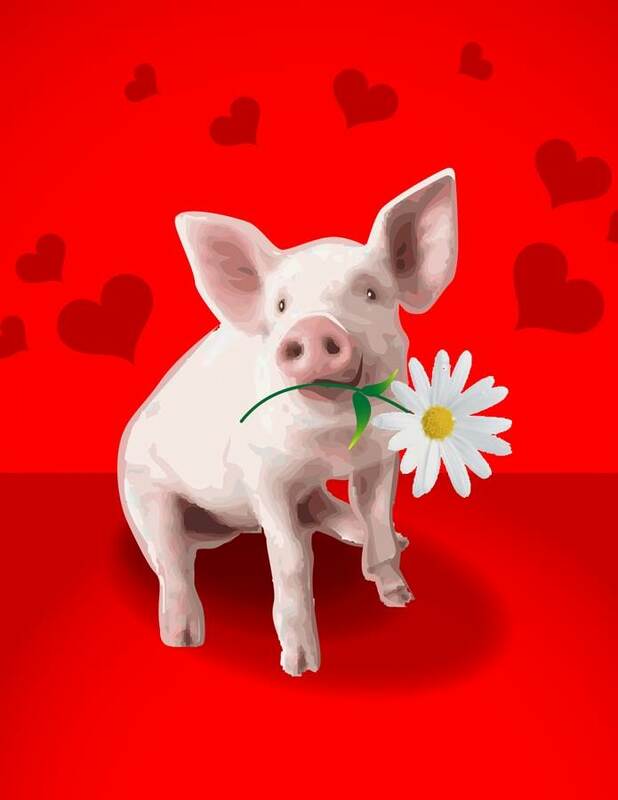 The blasted pig might as well be his Valentine. A glance at the cloudy sky told him night would come early. He picked up his pace in the chase after the pig. Leaves crunched as he pounded the twisting path, running, sliding, gaining, and losing. Sometimes he wondered if the little porker intentionally let him catch a glimpse of it. Once it actually seemed to be waiting for him to catch up. Robin was so exasperated he could have screamed. Until the unwanted memory of the bullies intruded on his thoughts, Robin had thought signing up for the Interstate Sheriffs’ Department exchange program had been the worst mistake of his life. To think he’d believed he was bored living in Asheville, North Carolina! It was a wonderland of excitement compared to Atonement, Tennessee. However, after he thought about it, chasing livestock through rural Atonement was probably better than dealing with the bullies and jerks back home. Robin shook his head resignedly. It was really clouding up, and it would be dark soon. Robin thought uneasily that he wasn’t exactly sure where he was anymore; the pig had led him on such a chase. That was kind of unnerving. He’d only lived in the area for a matter of weeks. The idea of being lost, in the woods, on a winter night was not something he liked to consider. Then he caught sight of the little rascal running up a trail. With a burst of energy Robin poured on the speed. That sorry pig was not going to get away again! It was headed straight for a tall iron fence. The pig kept running. So did Robin. He finally had it cornered. 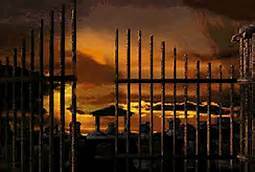 Or not… Were some of the iron bars bent aside? The young deputy cursed as the pig went through the gap in the fence. 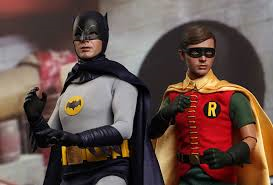 However, Robin Warden wasn’t any bigger than Batman’s sidekick with the regrettably similar name. He slipped through the damaged bars and made a heroic dive for the pig. It complained loudly when he caught it by its back feet. The wind kicked up as he tied a rope securely around the wriggling animal. He was so intent on his task that he didn’t notice how threatening and dark the black clouds became. Abruptly the pig became unexpectedly still. That’s when Robin realized the earth was trembling. A loud thump proved something heavy had fallen, but he didn’t see what it was. An earthquake? He knew Tennessee sometimes experienced very small quakes. A sharp crack made him jump half out of his skin. It sounded like lightning, but there was no flash, just the sharp, sudden sound. 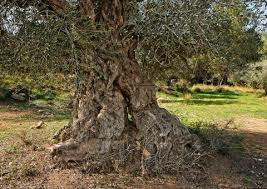 Robin looked over his shoulder and saw that a huge old oak tree had a wide split down the center of its trunk. The frightened pig huddled against him. For a moment it didn’t dawn on Robin that he was holding the animal. The ground stilled. Robin and the pig looked at one another with wide startled eyes. The pig looked as embarrassed as Robin felt. At least the guys weren’t around to see that awkward moment. He set the pig on the ground and stood up. Robin took a deep breath. “Oh crap!” he muttered when he saw that he’d dropped the rope. However, the pig sat calmly back on its haunches, like a well-trained pet on a leash. Robin quickly bent down and snatched up the rope before the animal could change its mind. Mystified by the pig’s sudden change in behavior, he scratched it behind the ears. It seemed to smile, but he guessed that was just the shape of its mouth. He patted the pig’s head and said, “Good pig.” Even as he spoke the words they sounded ridiculous. Robin spotted the source of the heavy thud sound. A tombstone was overturned. He looked around at a very old and rundown cemetery. 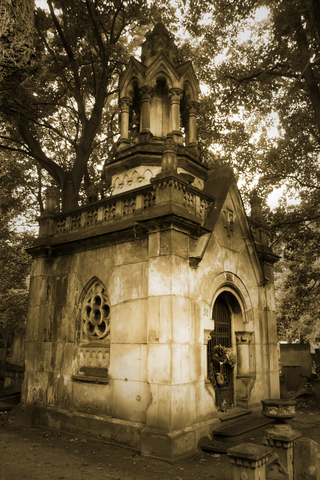 At least he knew where he was — the old Sunhold estate’s graveyard. A snuffling sound drew his attention. There was another pig behind the tumbled gravestone. Then he saw a third pig a few feet away, rooting in the tall dead grass. The more Robin looked around, the more pigs he saw. There were at least a dozen. Twilight descended and Robin stood in perplexed awe, looking at all the pigs. As the light dimmed, the pigs seemed to emanate a pale glow. The one he had spent most of the day chasing looked up at him with its smiling face and he took a reflexive step back. The pig had blue eyes. “What the—” he muttered, wondering how he had failed to notice that. The blue-eyed pig nudged Robin’s knee and swung its head toward the damaged oak as if it meant for him to look. The rent in the tree trunk shown with blue light that reminded him of the cobalt vase his mother had, a deep rich blue. The pig took a few steps toward the tree, as much as the rope would allow. However, the animal didn’t tug at the leash. Robin stood rooted to the ground. As twilight deepened the glow from the pigs became more apparent. The other pigs walked tranquilly toward the tree. The one on his rope sat back down, seeming patient and at peace. The cobalt blue radiance expanded beyond the tree. All the pigs snorted and snuffled in a way that sounded… pleased. Then a girl stepped out of the glow. The luminous pigs continued to look peaceful, but somehow Robin could feel that they were happy and excited. At first Robin thought the girl was little more than a child. But as she approached, Robin saw that she was in fact a petite woman. 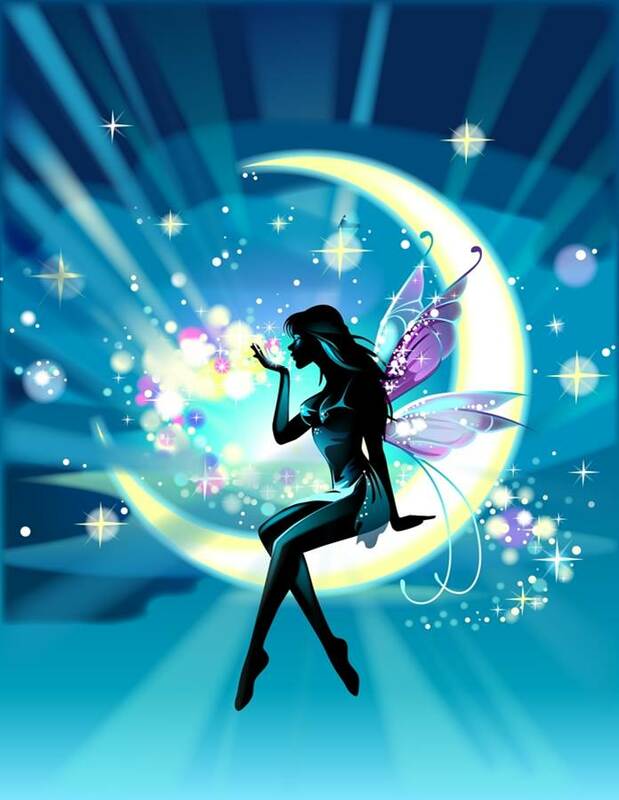 Long ash blond hair fell in waves like a river of moonlight that reached almost to her knees. Pale blue flowers were scattered through her tresses. 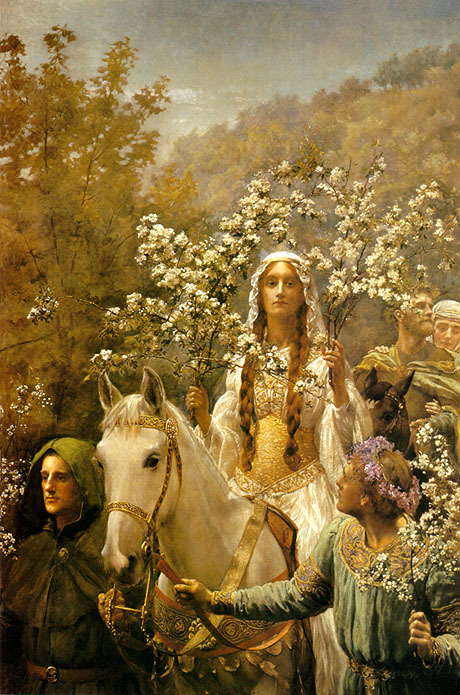 As she moved the blossoms seemed to bob on the currents of the moonlit river of her hair. Robin stood in open mouthed astonishment. She was so beautiful that he couldn’t speak; so purely lovely that there was no room in his mind to question the strange circumstance of her appearing. Finally the idea that he should say something tickled in his stunned thoughts. He tried to talk, and managed to make some kind of sound, but the noise that came from his lips reminded him of a hog squealing. The radiant pigs gathered in a half circle at her feet. They became quite noisy as they looked at one another and then up at the tiny woman. Grunt, snuffle, snort. Grunt, snuffle, snort. The porcine grunts took on a specific pattern and rhythm, and gradually came together as if the pigs were chanting. They seemed to grunt the same three syllables repeatedly, go-eh-win, go-eh-win. Finally the grunting chant flowed into the sound of a name, Goewin. He gazed up at her in silent wonder. No face had ever been so sublime. No name had ever b een so poetic. Goewin. She spoke his name and he thought he might die from the happiness the sound gave him. Robin didn’t realize that he had dropped to the ground on one knee, amid the glowing pigs that clearly adored her. He felt unworthy of her touch when she laid her hand on his head and told him to rise. He was no better than the pigs… probably even less. At least the pigs could glow. With weakness in his knees, Robin struggled to his feet. As he stood he looked into her eyes. He was astonished to find that they were lavender and as bright as any faceted amethyst. Then when Goewin returned his gaze, Robin felt so light of heart that he was surprised he didn’t float into the air. She exclaimed in delight. “Oh you found her! Deme, you naughty pig! Your brothers and sisters came right away, but you roamed the countryside in your game, getting this kind man to chase you,” she admonished the pig, but her voice was gentle. “Robin, I really am sorry that Deme led you on such a chase. She took an instant liking to you. To her it was a great game,” Goewin told the young deputy. It never occurred to him to question how she knew his name, or that he had been in pursuit of the pig all day. Robin could barely string two words together. She seemed to understand when she paused briefly. Goewin continued to talk, but he was sure she meant to give him a moment to adjust to the strange situation and her presence. By chattering she gave him time to find his voice. “It truly is important that I get these pigs back where they belong. Do you know that there has already been at least one war over these pigs?” she asked, but nodded as if answering for him. “Yes. And it was a very foolish prank that let them get away this time. How very shortsighted of that trickster to do such a thing. But you, Robin, have helped set things aright. You have my eternal gratitude,” she said as she lowered her eyes and curtsied deeply. She actually curtsied, he thought. First she’d placed her hand on his head and told him to rise. Now she curtsied to him. 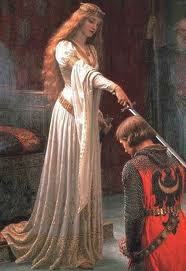 It made Robin feel like he was a knight of Camelot and she was a princess. Suddenly he felt strong and valiant, as if he wore the brightest armor. Then when he glanced at himself he gasped. He was glowing! A little anyway — the light wasn’t nearly as bright as the radiance of the otherworldly pigs, but he was definitely glowing. His reaction made Goewin giggle. It was like chimes, he thought. Her laugh made him smile. Robin didn’t know how long he stood looking at her like a dumbstruck fool. He didn’t even care if he was being silly. They looked into one another’s eyes, they laughed, he thought they even sang. Later he couldn’t say what they talked about, what they actually did, but he never forgot the bliss he felt. Moreover, he realized he might never feel such things again, so he simply enjoyed it. Robin remembered noticing the various changes to the sky as the hours passed. Then as pink and gold clouds streaked the morning, Goewin left. She didn’t ask him to come with her. Robin was pretty sure that she knew he was afraid to venture that far from the world he knew, so she didn’t invite him. The young deputy could have kicked himself for that fear, for not asking her to take him with her. However, Goewin touched his face and her hand sent a vibration that reached from his chin through his scull. After that all he could feel when he thought of her was joy and peace. However, that happiness didn’t stop him from going back to that same spot in the old cemetery every Valentine’s night. 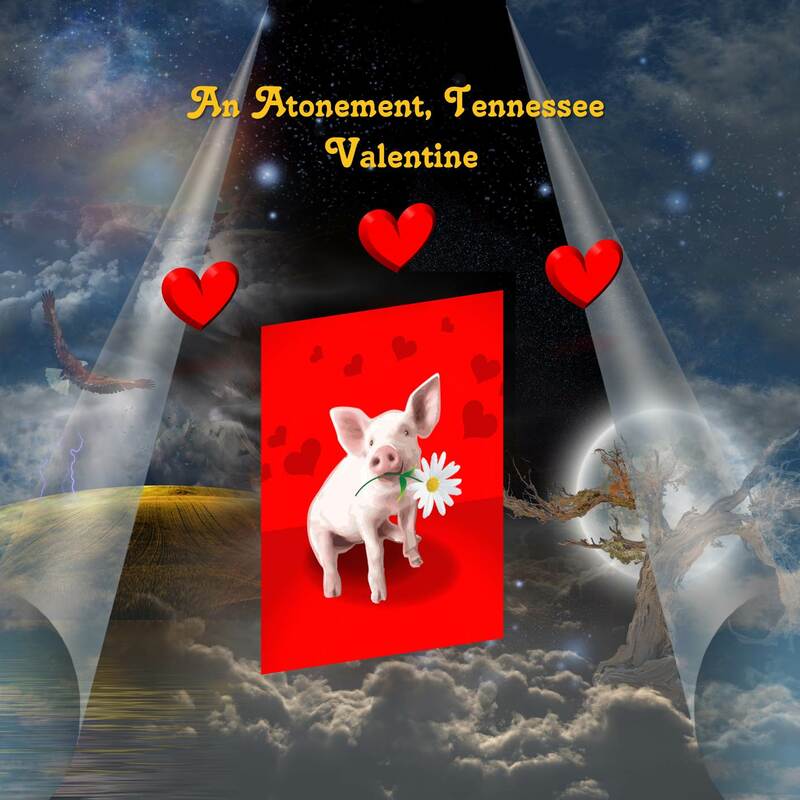 Posted on February 13, 2014 by Teagan R. Geneviene •	This entry was posted in Atonement, Tennessee, Short Stories, Teagan's Books and tagged Atonement Tennessee, Cemetery, Goewin, NaNoWriMo, novel, Pigs, Sheriff Robin, Short Stories, Sookie, Urban fantasy, Valentine's Day. Bookmark the permalink. I’m tickled that you like it. It would go great with your cookies! 😀 Hugs. Just now catching up to your stories. It was very nice. We all hope for love eternal and the “what if”. This was my favorite sentence-“ran faster than anything that might someday become bacon had a right to run”. Love it! It’s wonderful to have you back, RC. Tee-hee! I’m glad you got a kick out of the bacon quote. I had a good time getting inside the head of the young man who became Sheriff Robin. Maybe he should get more “page time” in Atonement book-2. Tee-hee, isn’t he (she?) adorable? I was so happy to find it in Microsoft clipart. Thank you for commenting, Sharmishtha. Thanks Judith. Keep on cooking good stuff! Aww… thank you Mary. Knowing what a romantic you are, that is indeed a lovely compliment! 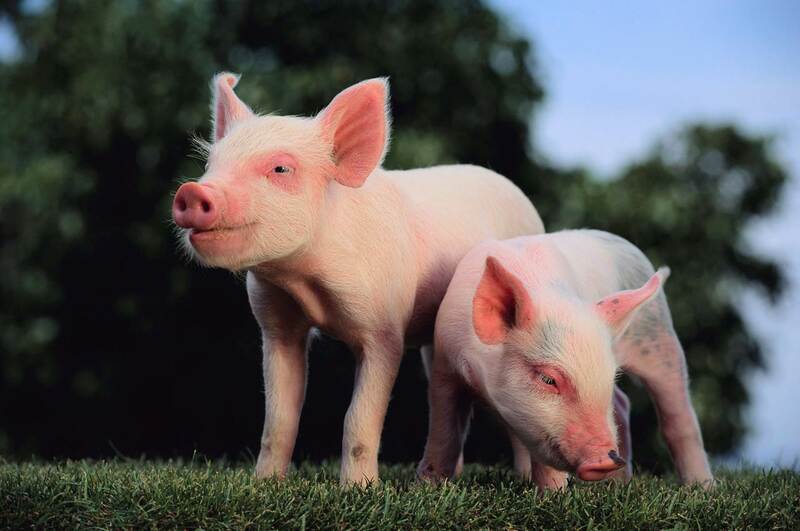 I’m not sure what made me think of having the pigs glow, but I enjoyed writing about them so much that the piggies might have to show up in another Atonement story! Ahh, I loved that story. The romantic in me hoped the pig would turn into a beautiful woman for him and be his valentine, but it turned out even better. Awesome! Great story. Plenty of atmosphere. Look forward to more stories from Atonement. And thanks for visiting my blog Teagan! How charmingly mysterious! You have a real skill at crafting your characters in an enticing manner :-). 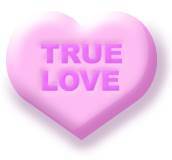 Wish you and fellow TB readers a delightful Valentines day. Ishita, you made my day! Thanks so much. Wishing you a delightful day of love and friendship as well. a perfect valentine day story, purely magical! loved it! Oh, thank you so much, Sharmishtha! I wasn’t sure how appealing the ending would be. Thanks so much Lynn! The same to you and yours. Why thank you David. Robin might still get his traditional happy ending in some other “Atonement” story. What a sweet story. Shame there wasn’t a Happy ending for Robin in the traditional Valentine sense but at least you didn’t have him marry a pig.